Prepare to meet the world's greatest pet owner. For many fish owners, finding a goldfish laying at the bottom of the tank usually means it's time to go shopping for a new aquatic buddy. But when one ambitious pet lover found that their female goldfish had apparently lost the use of her tail fin, a little bit of creativity managed to get the tiny fish swimming once more. As you can see from the video, the fish appears to get along just fine with its buoyant harness in place. 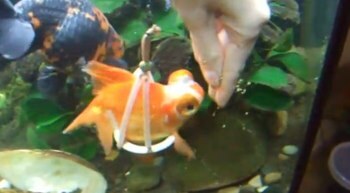 But because she isn't quite as speedy as the rest of her fellow tank dwellers, the disabled goldfish gets fed by hand, rather than at the top of the tank. "My disabled goldfish scooting around in her newly redesigned sling," the owner explains in a comment on the video. "She has trouble maintaining buoyancy on her own. She looks a little silly, but it is better than lying at the bottom of the tank all day!" Now that, ladies and gentlemen, is a dedicated pet owner. Bravo.